Brown-Forman hosted an experiential fair for employees to learn more about various disabilities. Brown-Forman is proud to be listed on TalentDesk's Best Companies for Disability Inclusion, coming in at #2 on their list, following Facebook. The scores are based on the Disability Equality Index (DEI) scores and Glassdoor's employee rating data. To see the full list and TalentDesk's ranking methodology please visit the TalentDesk website. 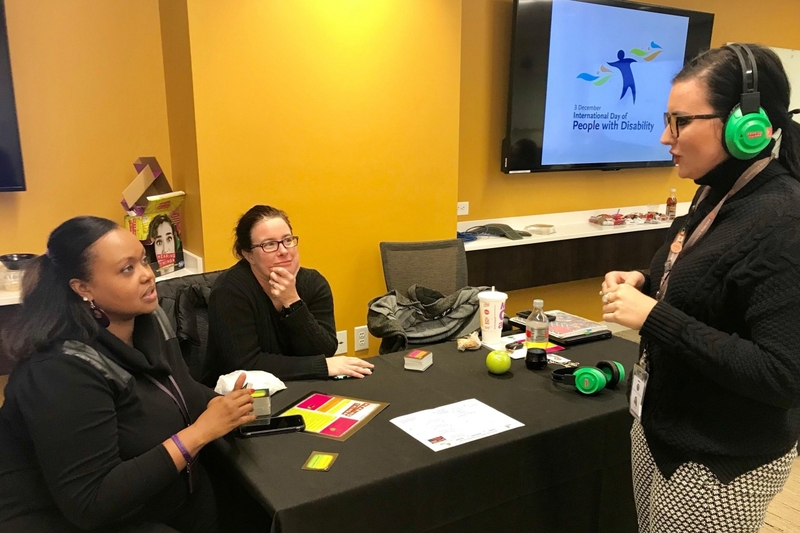 In celebration of International Day of Disabled Persons, Brown-Forman hosted an experiential fair for employees to learn more about various disabilities. In the photo above, Sherry Glenn (left), National Accounts and Midwest Division Administrator read phrases to Sara Colvin, Talent Management Specialist who tried to read her lips while wearing headphones with background noises playing.